The Kiwanis Club of Issaquah will present scholarships to one graduating senior from the following schools: Issaquah High School, Liberty High School and Tiger Mountain High School. The scholarships will each be a $1,500 cash award to be used to further the student's education. Applicant will have participated in school and community activities that demonstrate outstanding community service. Applicant will have participated in school and community activities that demonstrate outstanding leadership. Applicant will have demonstrated academic success. Applicant must be graduating from Issaquah, Liberty or Tiger Mountain High Schools and planning to attend a university, community or technical college. Applicant must submit a written application for the scholarship on or before April 30. The scholarship award will be made on the basis of community service, leadership activities and academic performance. A scholarship Selection Committee composed of members appointed by the Kiwanis Club of Issaquah will choose the applicants to receive each scholarship. The successful applicants will be announced by the committee and will receive the scholarship during an appropriate awards ceremony. 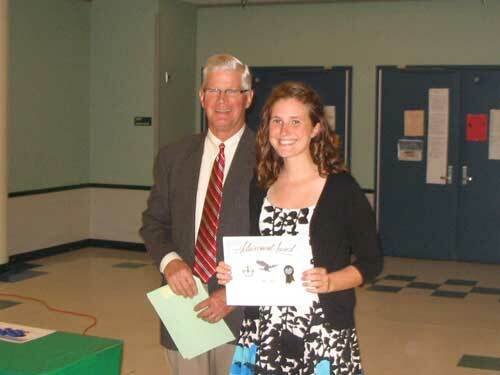 Peter Jarvis with our 2010 Liberty High School Leadership Scholarship reciptient, Allison Adams. © 2019. Kiwanis Club of Issaquah. All Rights Reserved. Kiwanis Serving the Children of the World! Click for Directions - Gibson Hall is the log building across Newport from the Salmon Hatchery in downtown Issaquah. Join us any Wednesday at 12:00 - 1:00 pm for our weekly lunch meeting & guest speaker! Rated 5 of 5 based on 4 rated reviews. Every summer free, family-friendly concerts are presented in a wonderful outdoor setting outside the Issaquah Community Center. Note: The Kiwanis Club of Issaquah assumes no responsibility for any sites linked to/from its website, has no obligation to edit posted submissions, and reserves the right to edit, rewrite, and delete content that it deems inappropriate for any reason.